Having spent 30 hours with my team, researchers, and consulting from experts testing over 20 air hammers, we concluded that the Chicago Pneumatic CP714 is the best air hammer for heavy-duty projects. It packs lots of power to hit harder, and it comes with a control trigger making it useful for diverse projects. Its best fit is in the hands of a professional looking to perform quick work in a body shop or industrial setting. It is also a very durable air hammer with superior precision. Here’s a short comparison of the products that made it to our list. If you want to know the specific features of these handy tools, you can have a pretty good idea about the one you want just by looking at their comparison here. Coming up with the products to include in our list is always a tricky process. This is because these air hammers have distinct features that make them better in a specific category. Here, you will find versatile and heavy duty air hammers that can work on just about anything to light duty tools that you will want to use in your DIY workshop for small tasks like shearing small bolts and rivets. We looked at the power of these tools alongside their ergonomics and durability. Some air hammers can give you a vibrating white finger that’s why it was important that their handling is also comfortable. This is a powerful air hammer designed for professional jobs. It is capable of the most demanding applications, but it is lightweight to allow use for a long time without fatigue to the hand. It works with aluminum and iron rivets up to 3/8 inches and bolts of up to ¼ inches. We even tried it on steel rivets, and we got lucky with a ¼ -inch rivet. But that’s because we were using some very good steel bits. Chicago Pneumatic has been around for over a century. Their tools prove to last the longest, and that is one of the reasons we chose their air hammer as a top pick. It is a well-rounded tool that will do bolt shearing, front end, riveting, exhaust, and kingpin bushing removal. The air hammer is true to its power with 2000 blows per minute. We used it on aluminum and iron rivets, and the tool is a beast as we found it exceptionally powerful with rivets up to 3/8 inches. We used it on other different size rivets to try and find out which size it is most efficient. This air hammer worked great with ¼, 3/16, and 5/16 size rivets but it struggled with 3/8 inch rivets. You will want to use quality bits if you wish you to get through thick 3/8-inch rivets. We tried performing some suspension repair on a van. And when it was time to remove the ball joint, we used our removal driver which went into the air hammer fast and smooth. It took only a few seconds to have the ball joint in our hands and conduct repairs on the van. With the great power expressed by this air hammer, it was such a relief to find that we could control the air pressure and the bit power. This allowed us to work with a variety of materials. It is only 3.3 pounds which makes it comfortable for extended uses. Thanks to its spool valve, it is easy to control the start and stops. We found that this air hammer is a bit noisy, but it’s not near to the highest that we tested. At 91dBA, you will still need to wear the ear muffs that comes with it. Chicago Pneumatic boasts a solid build. From the exterior look, I found the material to be of top quality. It must be an aluminum alloy because it does not did not show any signs of rust when exposed to moisture. But we found it is not built for cement which means it is only good with aluminum and iron. The price is high-end. And what do we say in tools world? The price is always a good indication of the quality of a power tool. Sunex SX243 is a robust tool designed to be sturdy and durable. It is useful for many jobs including chipping, cutting, hammering, drilling, and many others. It's long barrel allows it to take centre stage when dealing with heavy-duty applications like body shearing work. This air hammer is a professional duty tool for everyday body shop and DIY tasks at home. I could easily pick this air hammer for my car’s disk rotors any day. It’s one of those you know you can’t leave out of your arsenal as it comes in handy in so many jobs. Sunex SX243 felt powerful the first time I used it. We had been trying to remove a triple tree bearing by using a chisel and a regular hammer. It can be so tiring, but once I grabbed the Sunex my work was a breeze as the triple tree bearing came off in a like three seconds. It was actually too powerful that the bearing was in pieces. This tool worked on many different parts like the suspension parts, wheel studs, and even replacing a hub assembly. It did get tough when replacing the hub assembly, but overall the power will get you through. We did not get any chisels with this air hammer. It was pretty easy to find the ideal ones as it uses regular 0.401 shanks. It has a 3/8-inch hose which is responsible for the high airflow that we experienced. One thing that makes this air hammer stand out is the comfort grip. The vibrations are not as annoying as with other air tools because of the rubber grip. One of our experts was not using gloves during the test, which indicated it is good to use for a decent time. However, don’t go at it for extended periods as the hammer weighs 5.7 pounds. I noticed how heavy it was after a couple of minutes and it became uncomfortable after around half an hour. We do recommend having on gloves especially vibration gloves if you use it every day. Also, the hammer comes with a knob for adjusting the power. It is such a thoughtful addition since we could now get out another triple tree bearing without ripping it into pieces by reducing the power and taking it slow. Sunex SX243 has an aluminum alloy construction. We poured water on it and left it for a couple of days, and it was still shining as good as new. The steel barrel did show some signs of rust, so it was not such a good idea to leave it outside. Our chipping tests indicated it has the power to chip cement, rust, and paint, but not so good at cutting stone. If you intend to use it to cut stone, you will reduce the life of this air hammer. When removing a triple tree bearing, cover the surface with duct tape to protect the finish of the part. This way the air hammer will not scratch and destroy the finish. And remember to wear eye protection. 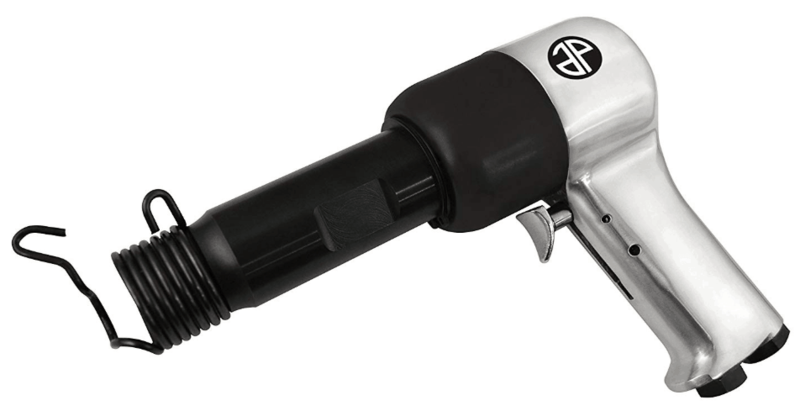 If you work in the automotive and construction industry, this air hammer is an easy choice. It has perhaps the highest power on our list which makes it good for exhaust systems and cutting metals as well as scraping and chipping. Ingersoll Rand Air Hammer 114QC is a high-rated model. Mainly because it is cheap and also because of its power to tackle anything from moderate to heavy jobs. It is also rugged to last in excellent condition. Being part of the Ingersoll Rand Edge Series, we were pretty eager to see what this air hammer is all about. This air hammer met our expectations as we worked with it on a variety of jobs. First, it was working on suspension works and removing axle shafts from hubs. Its 3500 blows per minute made it much easier to remove axle shafts than with the Sunex. We also used it to remove supercharger drive snouts, and it was effortless. Our next assignment was to remove porcelain and tiles which was fast and easy. But the hammer struggled with thinset even with a proper scraper chisel. We did like that the power is controllable using a knob that is located at the bottom of the handle. We also liked that we could dial in the exact speeds for different types of jobs. For us, it meant using low power to chip the tiles while we went full blast on the axles as they were pretty tough to push through. 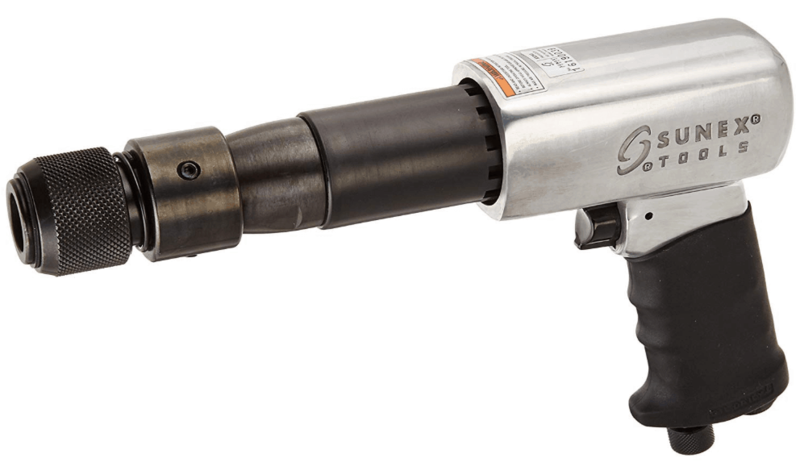 Weighing in at 4.1 pounds, the Ingersoll Rand Air Hammer is in the midrange. It is compact and lightweight with a contoured grip. The grip is rubberized to absorb most of the vibrations. I was able to work with it for one hour without any element of fatigue on my hand. We estimate you can use it for up to four hours continuously. 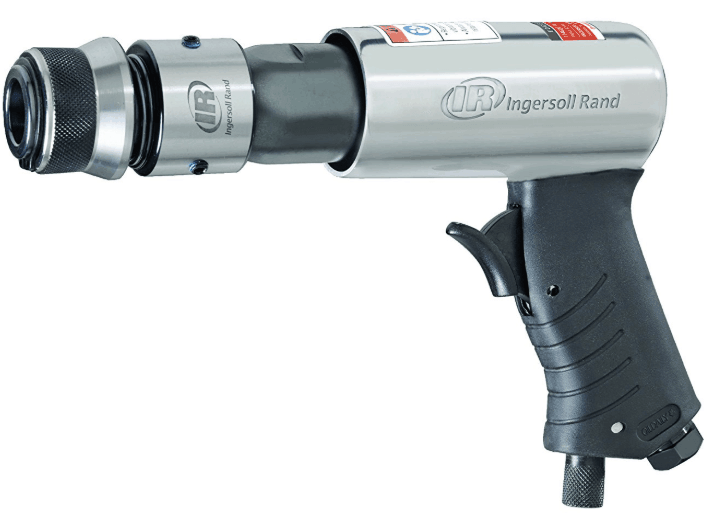 Ingersoll Rand Air Hammer is a lightweight yet sturdy tool. It comes with a heat-treated piston and an alloyed steel barrel. These two features increase its longevity as it proved strong against water, dust, and stone. We used it to rebuild a fireplace on the first floor of a client’s home, and it survived being dropped. Thus far, it has been great except for the chisels because they started showing signs of chipping on the sides. We would recommend getting better quality chisels if you wish to get the most out of this air hammer. For the price, Ingersoll Rand Air Hammer showed the most functionality in most of our projects. 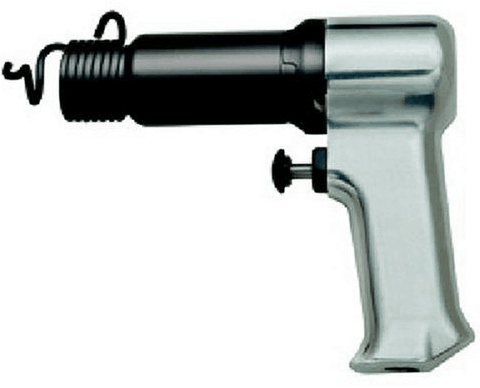 Astro Pneumatic Tool 4980 is a commercial duty air hammer. Although it has a lower power level than other air hammers, it is capable of handling heavy-duty jobs like truck springs. It also showcases exceptional performance when chipping, hammering, drilling, and cutting. This is a durable tool that will hit as hard as its competitors. It comes at a high-end price which means it has more to give in terms of longevity and handling. If you work in a commercial Setting where you have to deal with trucks and fifth wheels, this air hammer might be what you are looking for. It uses 0.498 shank and lots of air volume but then there’s no material it cannot get through. We had to wait like a month before receiving this tool as shipping is a bit slow. But once I got it in my hands, I could tell it’s a beast. We used it on a couple of jobs including removing suspension bolts in trucks as well as taking out bolt joints. If you have worked on a truck before, it can be a frustrating process when using a hammer and chisel unless you have some real power you are going to spend an afternoon cursing. We had been lining up this air hammer for some tough jobs which took us about two hours shaking off suspension bolts. With 1800 blows per minute, it was unbelievable how much work it got done in such a short time. The only reason we are not recommending this air hammer as the first on our list is because of the vibrations. This thing can really shake your hand, and unless you are working with anti-vibration gloves, we recommend not to use it for more than two hours continuously every day. The easy part was replacing the chisels as it was so effortless to go from one to the next because of the spring retainer. The first thing we noticed and liked was the alloyed steel barrel. It is a sure sign of durability as this air hammer was able to withstand grit, dust, water, and working around rusty stuff. We used it every day for two weeks around the heftiest jobs, servicing truck bushings, and it did not show any signs of losing some of its initial power. I can vouch for it on the longevity. 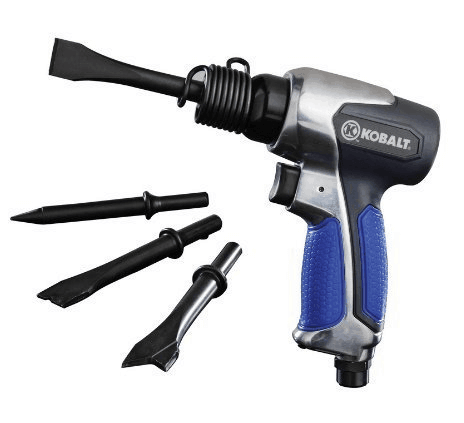 Kobalt Air Hammer is a midrange model that is best for light and medium duty jobs. It is sturdy, easy to control, and it comes with an ergonomic handle. The package includes four chisels so work will start without looking for the right size bits. It also has a 3-year warranty which is two years longer than the other air hammers we tested. Kobalt is not new to the world of handheld tools. From saws to pliers, you will always find a well-designed tool by Kobalt. This particular air hammer falls in the middle range when it comes to performance and applications. We were happy not to search our toolbox for the ideal chisel to go with this air hammer. Our first job was to remove a steering wheel shaft on a Chevy GMC truck. Since it has a shorter hand and 4500 blows per minute, it took me under a minute to loosen the nut. We also used it to sheer off rivets which we had tried using different methods like using a grinder and drill which is a bit of a process. But Kobalt made it look so easy as it only involves using a sharp rivet against the rivets head and a few seconds later the head was off. This air hammer worked with hefty rivets and chipping stone. We also used it to cut thick metal, but it was not as efficient as the Astro Pneumatic. This air hammer has a short, rubberized handle. I found it comfortable in my hands because they are small. This indicates it will be a bit uncomfortable in large hands. The vibrations are quite manageable. I guess it’s because of the use of rubber to absorb sound and some of the shocks. We liked that it has a coil spring retainer that allows quick chisel changes. The trigger made it easy to control the power and use it with delicate as well as robust parts. This air hammer looks nice with an alloyed steel barrel and a heat-treated piston. It can indeed hit hard but not too hard because when we used it to break bricks, it started showing signs of breaking. It will restrict its usage to the light stuff like small and mid-size bolts and rivets. If you are removing a spinning rivet, use a flathead screwdriver to hold it in place while you work your way on the rivet. You can also use a painter’s tape to keep it in place. This will prevent it from swiveling, and you can use both hands for the job instead of splitting your attention. The Ingersoll Rand 121Q is one of the top performers for heavy-duty front-end work. It has a one-piece alloy barrel which means it does not have any weak points. You can drop it and subject it to hefty tasks, and it will still perform as good as new. This air hammer is a low-priced super-duty option. It makes quick work of removing ball joints, pressing, hammering, chipping, and cutting metal. It has average air volume consumption, so you don’t need to bring your oversized air compressor. It’s easy to see why professionals love the Ingersoll Rand 121Q. It managed to pull 3000 reps per minutes with 3CFM. It has a lightweight body that made use doubt if it could do any real jobs. But we found it quite useful for crimping the sharp edge of a metallic sink that we had just cut the edges off. We used this air hammer to get out stuck fittings from a very tricky position in a bus. We used a long chisel to spin the nut counter clockwise. Being able to control the power during the starts made it easy to turn the nut. We nipped it a little bit, but it was easier than using a nut remover rod. Using this air hammer for more than 30 minutes meant dealing with lots of vibrations. This is because it is not rubberized, so the shocks are transferred directly to your hands. The good this is that it is only 3.5 pounds which made it manageable for longer when wearing gloves. We had a problem with the spring retainer as it was loose after only the first few uses. I wish it were a strong as the Chicago Pneumatic. Anyway, Ingersoll replaced it with a new one; only time will tell how long it will keep it together. This air hammer follows through with durable construction. It has a one-piece steel alloy barrel and a one-piece handle. It could handle tough riveting, crimping, cutting, driving bushing, and shearing rivets on a daily basis. It has a one-year warranty backed by Ingersoll which we wanted to see how good it was by contacting Ingersoll for the coil retainer. It arrived in time before jobs piled up. We only hope it will last as long as the 114GQC model which has not given us problems so far. The Chicago Pneumatic CP14 is the best overall in the hands of a professional and DIY enthusiast. It packs the power, length, and longevity to make it worth the extra dime. 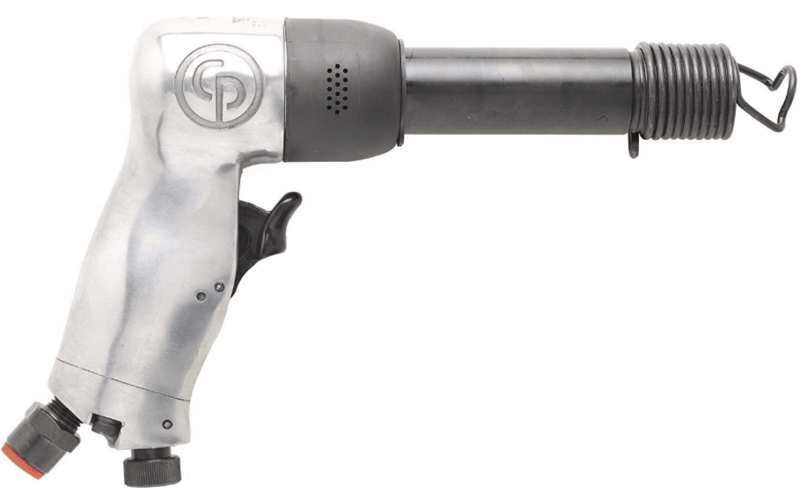 An air hammer is perhaps the most versatile tool for automotive, industrial, and DIY projects. 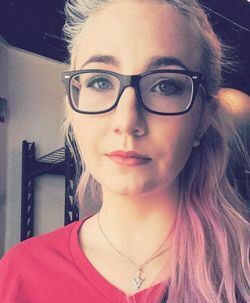 But you need to get the best there is if you wish to blandish metals, service trucks, crimp body panels, and make quick work on repair jobs in your garage or body shop. We’ve provided this short guide to start you on the process of finding the best air hammer. An air hammer is a pneumatic (air-powered) hand tool used for a variety of tasks. This includes breaking and cutting with the help of chisels. That’s why it is also referred to as an air chisel. Air hammers have their best use in carving stone, removing bricks, breaking masonry stone, chipping paint and tiles, breaking nuts and joints, etc. This tool is set apart from the regular hammer because it connects to an air compressor and it can accomplish more than with a standard hammer. In the automotive industry, an air hammer takes lots of bits and accessories for use in different tasks like cutting and shaping metal. It can even be used to straighten out dents with a smoothing chisel. Your hammer will be used in a multitude of tasks, but ultimately it must have the power to match your most demanding task. An air hammer with a high power rating is considered to perform much faster than entry-level air hammers with lower power ratings. A medium to heavy-duty air hammer with power from 2000-3000 blows per minute will handle a wide array of tasks. They are suitable for jobs involving bolt cutting and driving pins. Short barrels are best for light-duty tasks. They are lightweight and have minimal vibrations so you can work longer with them. They can cut thin sheets of metal, remove studs from wheels, but cannot deal with heavy-duty truck springs and rivets. Short barrels have a faster bit rate so you can perform jobs that need precision and make your job look more professional. Long barrels do not suffer the limitations of short barrels except for being heavy. A long barrel has a low stroke rate and can have lower vibrations but not all the time. These features make them ideal for tough and rigorous jobs. A progressive trigger is a nice feature to have in your air hammer. This is because it is safer to use and control. Air hammers are powerful tools that pose lots of danger when in use. With a gradually progressive trigger, it becomes much easier to stay in control from the very start. An air hammer works hand-in-hand with an air compressor. Your air hammer will have specifications for the air volume and psi requirements while the air compressor will have specs for air volume output (CFM), air pressure in psi, and horsepower. To properly operate you air hammer, you will be required to match or exceed its air volume requirements. For example, if your air hammer requires 4CFM at 90 psi, the air compressor should have a higher capacity than that of the air hammer. Air hammers can be classified into different categories according to their power and their barrel length. These are light and medium-duty air hammers that are used for most DIY projects around the house. They are the kind you pick when you want to replace tiles or cutting thin sheets of metal. These air hammers usually come with short barrels. These air hammers are designed to tackle industrial jobs that involve dealing with fifth wheelers and trucks whose parts are the toughest to handle. You will find that they do not use standard shanks and they mostly come with long barrels. It is crucial to follow safety measures when using an air hammer. Using your air hammer according to the manufacturer’s instructions will save you lots of headache. This is by using the recommended air volume and not over exceeding with the idea of working faster. Safety glasses will save you from flying fragments from the piece you are working on. For example, when chipping stone, cement, and tiles, lots of chips will be flying all over the place. Preferably use anti-vibration gloves as they reduce the risks brought about by a vibrating tool. Although they do not minimize risk by 100%, they ultimately provide sufficient protection when used on a regular basis. Dust and moisture from your air compressor will affect the life of your air hammer in a bad way. These elements are corrosive and will damage your tool within no time. Always use an air filter to reduce exposure to corrosive elements. In areas where there are lots of flying objects, be sure to protect others by setting up a screen around the area you are working. Warning signs can also serve to help others be aware of your job, so they are not accidentally exposed to flying fragments. It is without a doubt that an air hammer is an indispensable tool. We have looked at the Best Air hammers the market has to offer. We tested each of these air hammers in a bid to see if they matched up to our expectations. And they did, that’s why they made our list. Although you can always find a tool to substitute an air hammer, it proves to work harder and faster which will save you tons of energy and time. Go on and have an easy time with one of these air hammers!